He's beloved by the home fans, respected by his teammates and full of optimism when it comes to the 2011-12 NHL season. There really never seems to be a bad time to talk to Chad LaRose. The charismatic Carolina Hurricanes' forward exudes energy and enthusiasm even in the off-season. It's just the type of response you'd expect from the 29-year-old forward, once a pure goal scorer in his junior days, who altered his style to become one of the league's top forecheckers. But that's not to say LaRose can't still find the back of the net. In fact, he's hit double digits in goals in his past four campaigns, including a 19-goal season in 2008-09 and 16 tallies last year. 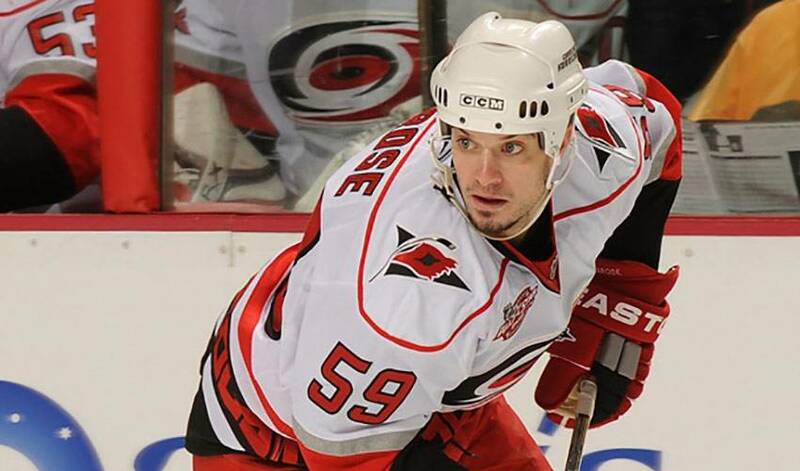 But for LaRose, who went undrafted before signing as a free agent with the Hurricanes in 2003, his biggest motivation is in helping put the Southeast Division squad back on the playoff map. They also happen to have some serious talent. While he might not share the same notoriety as some of his other goaltending brethren, Cam Ward, who won the Stanley Cup with the Hurricanes in 2006 becoming the first starting goaltender to win the NHL championship as a rookie since Patrick Roy in 1986, is one of the game's very best. “We have the best goaltender in the league,” offered LaRose, of the 2005–06 Conn Smythe Trophy recipient as the playoff MVP. “I truly believe that. He's phenomenal. It's not just that he makes saves - he's the type of goalie that makes the big saves in the big games. I think there have been times where we've made him do too much work, but he's always there and always ready. Then there's Jeff Skinner. Selected seventh overall by the Carolina Hurricanes in the 2010 NHL Entry Draft, the forward was the youngest player in the NHL during the 2010–11 season. The 19-year-old had 31 goals in his first NHL campaign, netting Calder Memorial Trophy honours as the league's top rookie. kinner, who played alongside current Boston Bruins' young star Tyler Seguin when they were junior teammates in TK, was one of Carolina's most consistent contributors throughout the year. He also caught the eye of his teammates early on. “Jeff was sensational,” lauded LaRose. “His composure and ability to score big goals was huge for us. It's quite funny when you look over at this guy and you don't feel that old. Then you realize you're 10 years older and that's when you know you're a veteran. LaRose is hoping the combined talents of the Carolina players will translate into a spot in the top eight in the East. Last year, in spite of seven wins in their last 10 games, the Hurricanes fell short of that goal. They went into the final day of the season able to determine their own fate, but lost 6-2 to the Tampa Bay Lightning to finish ninth in the East. LaRose sees better days ahead. He's looking forward to proving it when the season starts in October. It's exactly what anyone associated with the Hurricanes, fans, front office and the players, have come to expect from Chad LaRose.